Email newsletters are yet another powerful tool food businesses can use to promote what they do, highlight products, and keep themselves top of mind with customers. A really good newsletter keeps customers engaged, and wanting to know more, in a cost effective way. Sounds easy right? The reality is it takes a lot of work, and most importantly, a commitment of time to put together a good newsletter. Including photos in a newsletter is another way to grab the attention of your subscribers – especially when it comes to food. Keep them hungry for more (or just make them hungry) by sharing photos of the latest CSA produce box, the results of experiments with a new type of flour in the baking, or whatever best illustrates the written text. Photos can add life and colour to the written word and provide a compelling reason to keep subscribers coming back. We may be biased, but using the Foodtree app to snap you photos is a good place to start! An interesting subject line is the first step in getting people to open your newsletter. Remember, your newsletter is just one of many emails arriving in your customers inbox so use that subject line to grab their attention so they’ll read it rather than delete it. Keep it relevant to your subject matter and be careful not to sound spammy. Tip: Don’t think about the subject as a “title”, but rather approach it as if you ran into your reader on the street; be personable! People like to know what to expect, so establish a consistant format for your messages. Maybe you include a recipe with each letter. Maybe you share a recent photo of your farm or restaurant. Find something that’s “you” and include it every time. The look of the newsletter should be consistent with your existing branding and include your logo, address, and contact information. Use a template provided by your newsletter program (try Mailchimp or Mad Mimi) to create a layout that will work well with the information you plan to convey to customers and clients. Keep the newsletter short and easy to read without overwhelming the reader with information. People tend to skim rather than read long emails so err on the side of short and to the point. Do you run a CSA? Do you bring seasonal food to market? Do you have a special menu or time of day when some foods are freshest? Reward those faithful newsletter subscribers with exclusive offers or insider information! If customers are interested enough to subscribe and keep reading then make it worth their while to stick around. Rewards can come in the form of discounts, random prize draws, or special offers only for newsletter subscribers. People like to be insiders, so show them they’re appreciated. This is the most important tip of all. Focus your efforts on making your newsletter a pleasure to open and read. Find the right balance between conveying information related to your business, and keeping things light and fun to read. It’s also not a bad idea to try and make your readers hungry! There’s nothing more compelling than that mouth-watering feeling we get when great food is in front of us. A great newsletter should become a treat to your subscribers inbox, so include content you think they’ll enjoy and think about it like a face-to-face conversation. It shouldn’t be all about you. In fact, it’s better if it’s not; who wants to talk with someone who just talks about themselves? Put time into gathering news, facts, or stories for your newsletter that your readers won’t find anywhere else. Share your insights into the industry, or relay exciting news from your customers. Find a unique way to connect with your readers so that they feel like they know you, and you’ll find they keep coming back for more. You’ll quickly realize that your newsletter can actually be an important tool in bringing you business in the future! Add your newsletter tips in the comments! We’d love to hear them! We’ll keep them in mind when sending out our next Foodsletter (sign up here)! Photo by Ned on Foodtree. There is a staggering amount of information available about the food movement and it can be hard to know where to begin. In the interest of helping people to sift through the noise we’ve put together a reading list of excellent books about the food movement. Our list includes some of the top books released within the last ten years that have revolutionized the way people think about food, many of which come highly recommended by our team at Foodtree. Dive in to any one of them to learn more about what you’re eating and our global food system. This list is not in a particular order because it’s not intended as a top ten (or top thirteen in this case). These are books that might lead you to that “AHA!” moment that most of us in the office have experienced! Michael Pollan has written extensively about food over the years and is practically the poster boy for the food movement. This is a groundbreaking book that explores the questions of what we should eat by tracing four different food chains from source to plate. This is a personal account of the year Barbara Kingsolver and her family spent growing their own food and what they learned from the experience. It’s an inspiring read and brings awareness to eating food in season, and delves into different aspects of the food industry. There are also numerous recipes throughout the book, including one for making cheese. Not as well known as some of the other books on this list, the Fruit Hunters is a fascinatingly detailed account of the world of fruit. There are hundreds of varietals of fruit around the world that we don’t have access to in North American grocery stores. Adam Gollner’s sensuous descriptions will have you craving exotic fruits of all kinds, and give you a peek into the crazy world of the fruit obsessed. Originally written as a series of articles for the Tyee, this is a first person account of eating food grown and processed within one hundred miles. Smith and MacKinnon pioneered the idea of only consuming food sourced from within a limited radius of home, and their experience highlights how much we rely on food imported from elsewhere. This is written by a man who has been a life-long fisherman with an intimate perspective of the state of our oceans. He creates a thorough analysis of the state of wild and farmed seafood with a focus on the four fish we consume the most: salmon, sea bass, cod, and tuna. The most important ecological question facing the oceans today is how we can sustainably meet this demand for certain types of seafood while using different methods of capturing and farming fish. In this carefully researched and vividly recounted narrative, Roberts lays out the stark economic realities beneath modern food and demonstrates how our institution of making, marketing, and moving what we eat is less and less compatible with the billions of consumers that system was built to serve. There is a movie of the same name loosely based upon this non-fiction account of the affects of fast food upon North American culture and the food industry. The author goes behind the scenes to reveal terrifying bits of information that will be enough to put you off fast food forever. As with Michael Pollan, Marion Nestle has written an extensive list of food movement books you should also read. With Food Politics she focuses on the industry of food and the fierce competition by big business for our food dollars which has led to an increase in obesity and a decline in health despite a surplus of food. When it comes to the mass production and consumption of food, strategic decisions are driven by economics rather than science, common sense, or health. Bottomfeeder is another perspective on the seafood industry, this time from a food lover’s perspective. Author Taras Grescoe shares the experience of his round the world quest for a truly decent seafood meal. He provides readers with an explanation of how to choose the best fish for our environment and our bodies, and eating from the bottom of the ocean food chain rather than from the top. The unhealthy truth is that much of the food available in North American grocery and fast food chains is full of things that aren’t good for us. Robin O’Brien examines the direct relationship between the manipulation of food and the increase in food allergies in children and cancers in adults. She offers recipes and an action plan for eliminating toxic ingredients from your diet and moving towards a healthier life. Celebrity chef Jamie Oliver has been on a crusade that last few years to promote healthy eating in schools. This is a companion book to his television series, “The Food Revolution“. It is a recipe book with step-by-step instructions for simple, healthy meals for people who don’t know how to cook. Mark Bittman is the author of the popular cookbook, “How to Cook Everything”, which is filled with recipes and instructions to get people to learn to cook for themselves. With “Why Food Matters” he’s put together a handbook on eating healthy that is not reliant on animal products and nutritionally worthless food. Recently published and written by a former Vancouver City Coucillor, this book focuses on ways for urban centers to move towards food security. The focus is on the need to bring food production into our communities to ensure that fresh sustainable food is affordable and widely available. It’s full of advice on how to join the local food revolution. Any books you’d add to the list? What books do you consider a “must read” when learning about food? Image by Tess on Foodtree. A lot of small food business owners don’t blog because they don’t see the point. It’s not always clear what the immediate benefits are, and justifying the time away from more tangible business activities can seem like a waste of precious time. We all know how busy farmers are. Restaurant owners, artisan food vendors, food truck entrepreneurs – they’re all typically starving for time, and any addition to the daily or weekly routine needs to be matched by a clear benefit to the business. Bringing food to us takes a lot of time and effort! That said we pay a lot of attention to the ways that food businesses relate to their customers, and think it prudent to outline the ways that blogging can provide hard-working food entrepreneurs with tangible value. If you’re not at all familiar with what a blog is then watch this video by Common Craft, Blogs in Plain English. It was made in 2007 but the information is still relevant today. Let’s talk about why you should be blogging if you own a food business. These days people are looking for more information about what they eat. They want to know who they’re giving their money to, and they want to feel connected to the people who are producing their food. This offers food business owners a huge opportunity. Consumers want to know about farming practices, sustainability, production methods, and how far their food has traveled. They want to see pictures and videos of the people making their food, along with pictures of the places that their food comes from. Increasingly, food consumers are rallying behind their favorite restaurants, farmers, and providers…often these are business owners they’ve met in person or feel an affinity for. A blog can establish that affinity. Transparency is king these days and a blog is the ultimate platform for opening up. Most blogging platforms are free to use and easy to set up. Within minutes of creating an account you can write your first blog post and share it with the world. Commonly used blogging software include WordPress, Tumblr, Posterous, and Blogger. That said, the cost isn’t purely monetary. It takes some time to sit down and compose a post, but conservatively the time commitment’s about a half hour. When the benefits of connecting with your customers are weighed, it’s undoubtedly worth it to spend that half hour at least once a week. Having an active presence on the web makes it easier for people to find your business online. Million of people are searching Google for food every day, and you’re best advised to make sure that you turn up in those results. It’s easier than you think. A blog is a simple way to make sure Google’s searchbots find you and your website. Your content will turn up in search results and the more you write, the more likely it is that potential customers will happen upon you when looking for the food they love. Blogging allows the people in your audience to share what you’re saying with the people in their audience. If they like what you’ve shared on your blog, they can easily share it beyond your immediate network of food lovers. Food bloggers can link to it from their own blogs. Customers can email it to friends, share it on twitter, or post it to Facebook. The possibilities are endless. Consider the alternative; everything you say to a customer in person, or via an advertisement, is likely only going to reach them. It won’t reach their friends, family, or foodie network. There’s no better place than a blog to keep your customers informed. You’re a restaurant about to launch a new location? Write a blog post. You’re a farmer with a new crop of tomatoes about to go to market? Write a blog post. Your blog is an outlet to share news and information with your customers (and potential customers). It allows people to get to know who you are, your products and business practices, and upcoming specials or events. Share your thoughts in the comments; why else should food businesses blog? At Foodtree we want your food photo sharing experience to be social. It’s far more enjoyable to interact with other users who get just as excited about fresh local food as you do. With this in mind, on our last release we’ve made it even easier to share your photos on Twitter and Facebook. Now there are two methods of sharing in the app. Sending to Twitter and Facebook when adding a new photo. 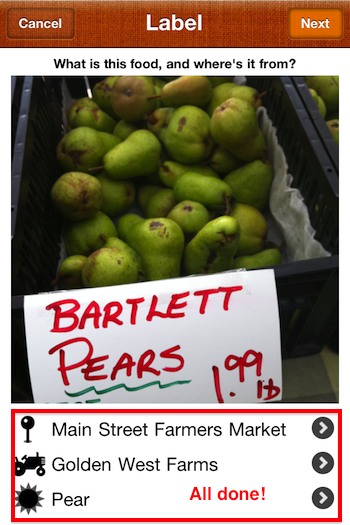 You’ve taken a photo, tagged it with market, vendor, and food type information (see previous blog post). The next option is to create a caption which will go underneath the photo in the app. As you type in your caption the comment field will keep a character count. Tap Done at the bottom right of the keyboard when you are finished typing and it will disappear. 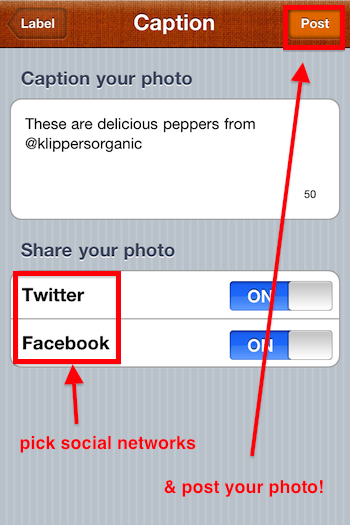 On this screen you have the option of sharing your photo to both Facebook and Twitter. This will include the caption you’ve written with a link to the image on the Foodtree website. (Here’s an example). These options toggle on and off, and once you’ve chosen where to share just hit the Post button in the top right corner and you’re done. The photo appears in the app, on Twitter, and on your Facebook profile page. Sending existing photos to Twitter and Facebook. As with deleting a photo you click on the arrow icon in the top right corner of a photo to access Twitter and Facebook options. At this point you can share your photo to Facebook and Twitter but not at the same time. 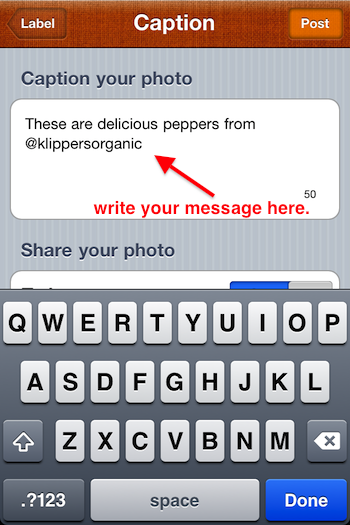 Keep in mind that the app will generate a default message rather than allowing you to create your own. 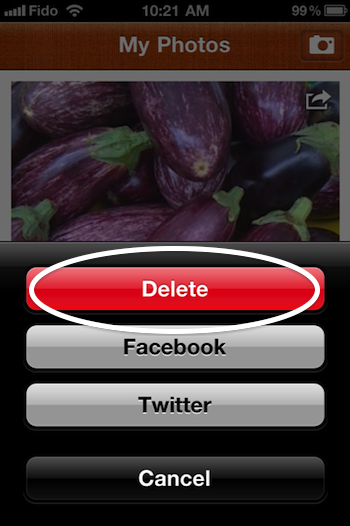 Tap the Facebook button and the app will ask if you want to post the photo to your wall with the message, “Found some fresh Eggplant* on Foodtree”. Tap post to share it to your profile page wall. (* the food is based on the food type you’ve tagged the photo with). 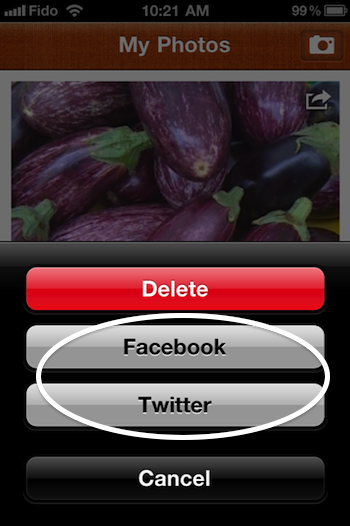 Tap the Twitter button and the app will ask if you want to send a tweet with the message, “Found some fresh Eggplant* on Foodtree”. Tap the Tweet button to share it to your Twitter account. If you have any questions let us know, or drop by our Community Support forums. You can download the Foodtree iPhone app for free from the App Store. Our How-To Series includes tips on how to use our mobile app and website. We know some of these will be obvious to some users, but they’re all questions we’ve been asked from time to time, so we want make sure answers to these questions are easy to find. If you have any questions that might make for a good How-To, shoot a quick email to community@foodtree.com! Ever taken a photo you just weren’t happy with? Or accidentally snapped a photo Eggplants and labeled that photo “Eggs”? Don’t worry, it happens to us too. 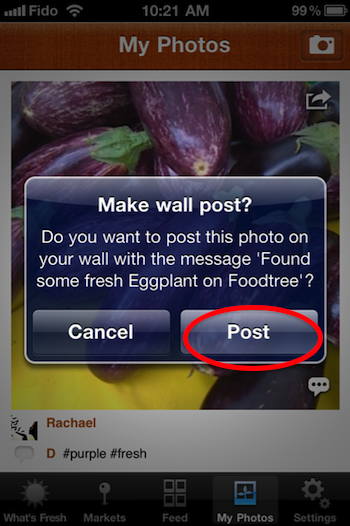 Now we’ve got an easy way to clean out photos you’d like removed from your Foodtree feed. At the top right corner of every photo you’ll find a small arrow icon. Tap it to bring up further options, including deleting the photo. On the next screen you’ll find the big red delete button (along with sharing options we’ll get into in another blog post). Once you click delete there’s no going back because the photo will immediately be removed from your photo steam. You can always hit cancel at this point if you change your mind. The deleted photo has left your photo steam, and you’re done. If you have any questions let us know, or drop by our Community Support forums! We know that the farmers market is a busy place, and we’re often pretty focused on all the great food and our shopping lists while we’re there, so snapping pics of the great food surrounding you shouldn’t take more than a second. We’ve tried to make the process as easy as possible, while still allowing you to identify which farms and markets your local food is coming from. Lately we’ve come to realize there are a few useful features in the Foodtree app that aren’t obvious to everyone. We’ll try to make it more clear in a future update but for now we want to make sure you’re up to speed on how to quickly use the app in your markets. 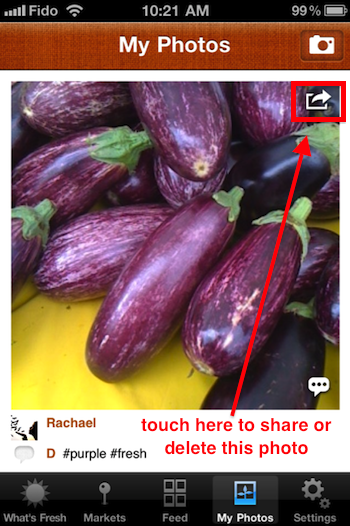 Here’s a quick highlight about adding information to your photos in the app for source types and food types. You’ve taken a photo and the app asks you to add information below the image about the market, producer, and what the food is. Tap on each field to add the information. For market information, we’ve made it easy because the app will suggest the closest local market to you based on GPS location. For “Where Is It From?”. This refers to vendor or producer information where you’ve taken the photo. When you tap through a long list of market vendors appears. Rather than scrolling through the list just begin typing in the name and the app will bring up suggestions. If you can’t find the name you’re looking for there is also the option to add new information. “What is it?” refers to the type of food you’ve taken a photo of. As with food source information, on this screen a long list of food types will appear, and again, the list will respond suggestions as you type. If you don’t find the food type you’re looking for there is also the option to add something new. You’ve added all the information to your photo and shared it with the Foodtree community! Now everyone nearby knows where to find those early season pears.